Photography exhibition of images and ideas. Experience indigenous people of Africa, the United States and Mexico as family, through the lens of two photographers/filmmakers/futurists on their journey to discover the human potential. Ancestral mandates are a strong theme in indigenous thought: integrating the past, present and future creates a vibrant, constantly evolving consciousness. Through the images in this exhibition we sense the rhythms of creation as they are embodied in the way of life of indigenous peoples. We see a universality that spans time – from the world’s oldest people in the Kalahari Desert of southern Africa, to the last pure descendents of the ancient Maya in Mexico, to the modern-day Ute, Hopi and Wabanaki in the United States. These people carry the ways and dreams of their ancestors into their daily living in the modern world. We feel these rhythms in our own lives. We dream the dreams our ancestors dreamt for us, and when we look at our own children we dream those dreams for them. All of humanity becomes an ocean of great dreams. And where will we take these highest aspects of ourselves that we hold deep in our hearts, dream about, and long to realize in our daily living? and Bushmen of the Kalahari. These are taken from the 8 “Family Albums” from each tribe which are on display. Click HERE for Andrew’s photos of the Kalahari Bushmen. It is the destiny of the people of the Americas to come together as one family and show the world how to live in peace through freedom of the human spirit. The indigenous people of the Americas have been holding keys to the freedom of the spirit for all of humankind through their connection to the Earth and the unseen universal forces. When we bring together what they know and what the modern cultures have learned by experiencing the scientific paradigm, a synthesis will occur which will create a whole new way of walking on Earth in harmony with all of Creation never experienced by anyone since the beginning. Click HERE to see inspiring videos of the Journey. 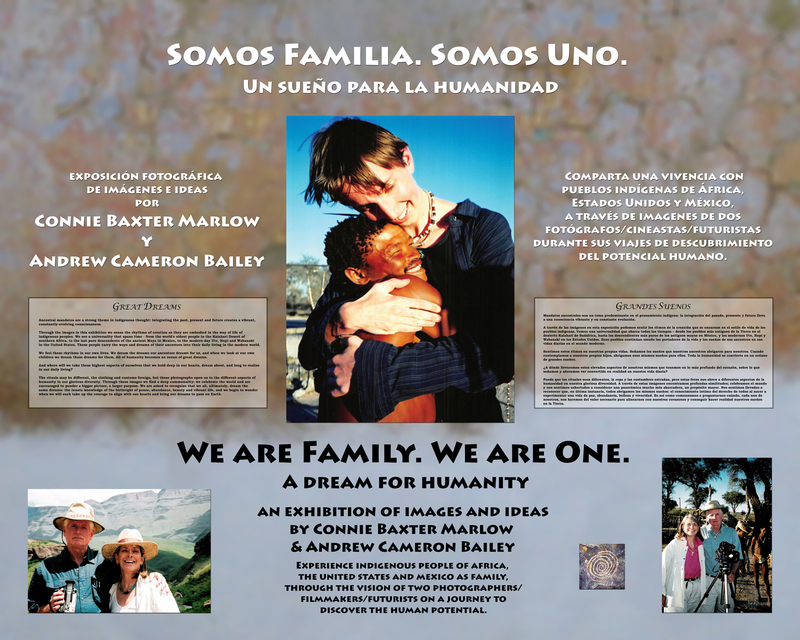 Connie Baxter Marlow and her three young children first came to Na Bolom in 1990 as a continuation of her relationship with Native Americans and their cosmology/cosmovision. A Hopi man told her the Hopi were descended from the Maya, and circumstance brought her to Chan K’in Viejo and his family through Trudy, Dona Bety and Na bolom. 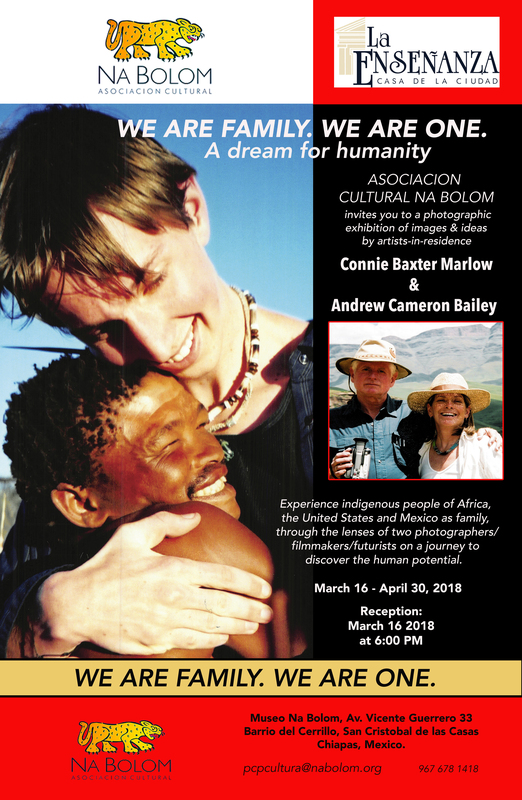 Connie had an ongoing relationship with the Lacandons through 2001 when a larger photography exhibition entitled “Rhythms of Creation: Impressions of Indigenous Peoples of the World” hung at El Puente which featured the works of Connie’s father Jack Baxter, her daughter Alison Baxter Marlow, and husband David O. Marlow. She reconnected in 2017 with Chan K’in Cuarto’s family in Naha, and with Na Bolom when with Patricia Lopez invited Connie and Andrew to have an exhibition here. 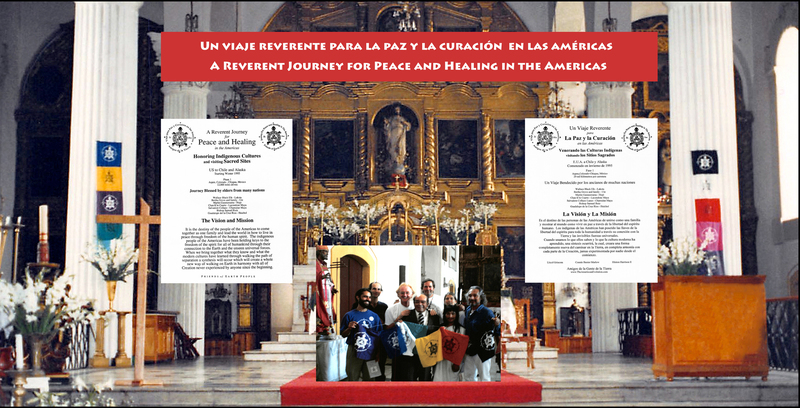 In 1995 Connie embarked on “A Reverent Journey for Peace and Healing in the Americas honoring indigenous cultures and visiting sacred sites in the US and Mexico. This journey was blessed by elders from many nations including Salvadore Collazo, Chamulan Maya, Chan K’in Cuarto, Lacandon May with a traditional Balche Ceremony and Bishop Samuel Ruiz whose vision of the importance of the indigenous people in the future of society is aligned with Connie’s. Connie and Andrew met in 2003 and have been making films and writing books together to bring indigenous cosmology into the mainstream understanding of the nature of the universe in order to reach a higher level of the human potential. Andrew Cameron Bailey was born in England, and raised in South Africa amid the Zulus during the Aparteid Era. He became a photographer/filmmaker in the 1960’s pursued a degree in anthropology, and was a university teacher of chemistry and mathematics in Durban, South Africa. He moved to the United States in 1969 where he married and raised 5 children in New York State as a construction engineer. He and his wife, also South African discovered the stories and way of life of the Bushmen of the Kalahari in the 90s and formed Indigenous Heritage, a foundation to aid in protection of their culture. Through this work Andrew and the Bushmen formed deep relationships that are reflected in his 2004 photography which you will find in this exhibition. Andrew and Connie met in 2003 and their mutual interest in indigenous people, photography, filmmaking and the evolution of consciousness of humanity has led to books, films and exhibitions to bring to light the indigenous expanded view of the nature of the universe which quantum science is now proving to be a more accurate explanation than the out-moded scientific paradigm that our current reality is based upon. Integrating indigenous values, concepts and cosmology into modern thinking is critical to the evolution of the human potential and to walking in balance on Earth. We ask you to ponder a bigger picture: a world of beauty, balance and abundance for all. Click for our CALL-TO-ACTION: Unity 2020!